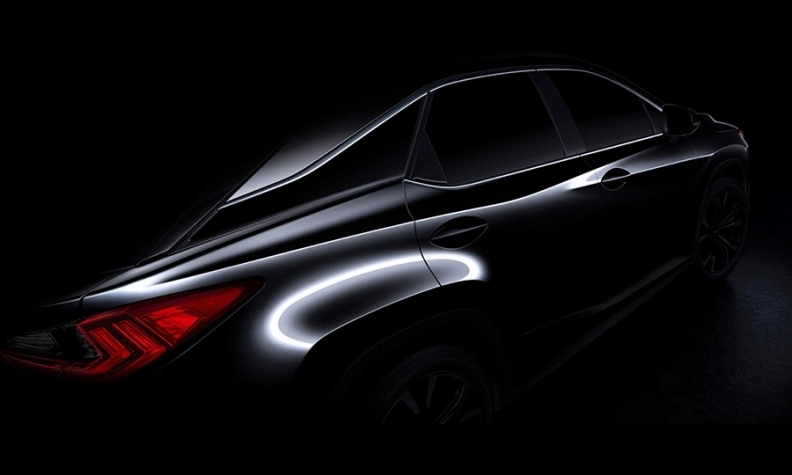 Lexus released this teaser image of the redesigned RX crossover to be unveiled at the New York auto show. Lexus is gunning to regain the U.S. luxury sales crown, and it’s about to get a big boost next month at the New York auto show when it unveils an all-new RX crossover. The RX is a giant in the segment, one of only two luxury nameplates that regularly exceed U.S. sales of 100,000 units (the other is the BMW 3 series) each year. In a typical year, the RX will make up a quarter of the brand’s U.S. sales. The fully redesigned 2016 RX, the fourth generation of the vehicle since its original introduction 17 years ago, is larger and roomier than the current model and will feature a range of advanced safety features. It shares some components with the Toyota Highlander. Lexus rode soaring RX demand throughout the last decade when is held the luxury sales crown for 11 years in a row. But Lexus car and light truck output was hurt by the 2011 tsunami in Japan and it fell behind both BMW and Mercedes-Benz in sales. Last year, Lexus closed the gap with its German rivals, although it didn’t get much growth from the RX. U.S. deliveries of the crossover totaled 107,490 but increased only 3 percent from the year before. Once the 2016 model hits the ground, however, Lexus is counting on a surge from its top-selling model. In 2014, BMW held off a late drive by Mercedes-Benz to win the U.S. luxury title; Lexus finished 19,000 sales shy of second place. Lexus' year-to-date U.S. sales through February total 46,126 vehicles, an increase of 26 percent over 2014, and placing it second behind Mercedes.